Bissau is a village of Rajasthan’s Jhunjhunu district. Bissau Thikana is the part of Panchpana estate and hence awarded to Thakur Keshri Singh by his Father MahaRao Shardul Singh Ji. A later ruler Thakur Shyam Singh ji was a great warrior and he shared a close relation with Maharaja Ranjit Singh of Punjab. In the times of Thakur Shyam Singh Ji, Bissau gained the wealth and importance. The Bissau fort is standing tall in the heart of the village but not in a good condition. 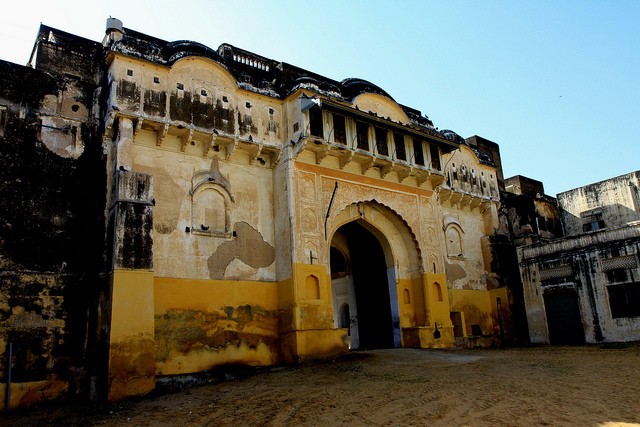 Although the rich frescoes are still there on the walls of the fort. A large statue of lord Shiva was intalled in Bissau recently , the same is agreat tourist attraction. Kashi prasad Vaidhya (Khemka) Haveli. Temple of Venkat Bihari Ji. Location of Bissau: Bissau is located on the Jhunjhunu – Churu road and is also conneted with the Churu – Jaipur Railway line. Jaipur International Airport is the nearest one.